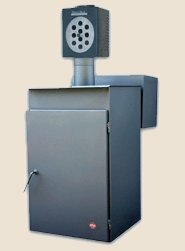 The Juniata RSFD-07 Utility Stove is ideal for garages, workshops, cabins and basements. The large Hopper and Ash Pan will allow you to set the unit to burn for up to 7 days, without the worry of refueling. The patented "Tri-Burner" efficiency stoker system is easy to use, reliable, and constructed to exacting standards and is fully automatic.